As Millennials flood the workforce, progressive enterprises are trading the culture of silos for one of collaboration. With today’s hiring managers valuing collaboration as an important skill among entry and mid-level candidates1, it is important for companies to continue evolving their workplace collaboration practices in today’s digital marketplace. Millennials — a cohort estimated to comprise 75 per cent of the global workforce by 20252 — are influenced in many ways by a collaborative work environment. Not only do they expect it, and find meaning in it, but they also stay longer with companies that foster it. In fact, 88% of millennials prefer a collaborative work culture3, reflecting a generational shift as digital collaboration tools continue to advance. As smart organizations invest in technologies that encourage an easier, more natural cross-pollination of ideas between members of staff, they have a mobile, collaborative workplace in mind. It’s a trend that signals a sea change for traditional business meetings, as stolid gatherings give way to lively virtual exchanges made possible with collaborative digital tools such as the Samsung Galaxy S9 and S9+. With the camera reimagined for communication through images and video, the Samsung Galaxy S9 and S9+ feature advanced functionality, including real-time translation from Bixby, a personal voice assistant. The workplace of the future will also benefit from another product: Samsung Flip, a next-gen digital flip chart that offers integrated screen-sharing functionality as well as the ability to import device-stored content onto its screen. Password protected and portable, Samsung Flip allows real-time sharing, annotation, movement and even searching, as well as the ability for multiple users to create content at once. 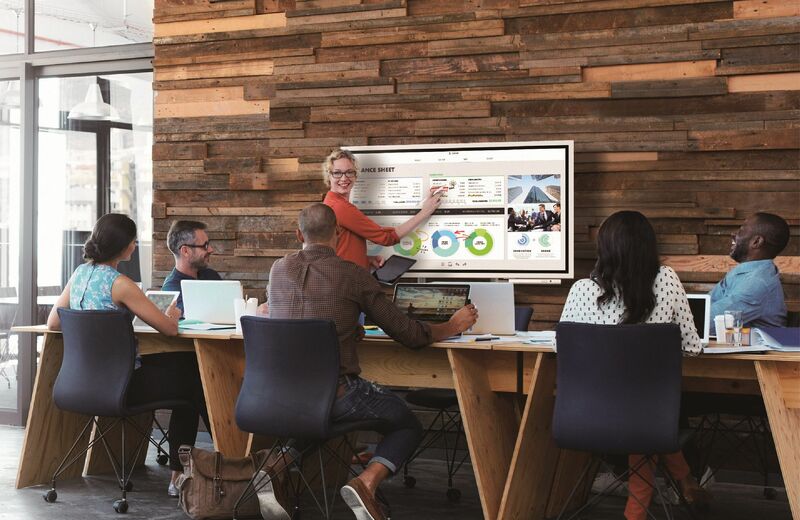 Whether organizing, holding, or recapping a meeting, Samsung Flip’s interactive display promotes collaborative digital engagement and an unimpeded exchange of ideas. There’s something to be said for being able to introduce fresh ideas on the fly and giving individuals the tools to work together in teams. Collaboration drives efficiencies by pooling talent, sharing strengths, and fast-tracking solutions. It’s hard to ask for more from either a phone or a flipchart. Experience Samsung Flip, Galaxy Note8, Galaxy S9|S9+ and other transformative collaboration tools by visiting the Samsung website. 1 According to a study on Canada’s workforce from the Business Council of Canada and Aon Hewitt (March 2016). 2 According to a report from the Brookings Institution (July 2014). 3 According to a study from the Intelligence Group (January 2014).